Bible verses read by David Suchet. This podcast is so insightful an amazing! Finally someone shows the true side of Islam- peace and the truth- “Center” of all faiths. He is a very inspirational personality! Religion: Allah delivered by the people through the prophets is a divine law. SAMİ YUSUF with the divine, to greet, meet, beauty, peace, helping and under the divine light that invites you to a meeting. And also Thank You for this wonderful interview. Thanks for nice interview.You’re number one, br.Sami.God bless you.Azerbaijan is proud of you.Best regards from your motherland. What a wonderful episode, merging the common values of the two great world religions, and showing the beautiful spiritual unity in the diversity. There is ultimately a lot more things that connects and unites us than what separates us. Considering the chaotic world we live in, we need more open minded people like Sami Yusuf, who truly understands the “true spirit” of all revealed religions with an universalizing approach. Thank you once again, and we sincerely hope to listen to more episodes! 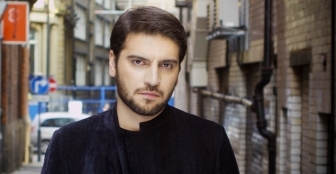 Firstly, I would like to Thank you so much for giving us this opportunity to listen to Sami Yusuf! He is really wise and inspiring, he’s proven time and time again how much of a deep thinker and kindhearted he is. I really enjoy listening to his spiritual speeches as much as I enjoy listening to his beautiful songs. Moreover, I think that we need more people like him. I wish media would actually pay attention to Muslim intellectuals and people like Sami Yusuf to reflect the true image of Islam, rather than paying too much attention to a group of psychopaths terrorists that commit crimes in the name of Islam. I also would like to say, I like the fact that, Bible and Quran possess many similarities, Christianity and Islam share a historical and traditional connection,The two faiths share a common origin, significant similarities, and spiritual elements. Finally, I think that we have to open our minds and hearts, in order to understand, respect and love each other and work together for a better future. I’m happy to know Brother Sami Yusuf shared his thought about Bible, one of the three holy books that Muslim should believe besides the Quran, just as we believe in Jesus. Great interview! He is a real philosopher. Thanks for letting us enjoy and benefit from his deep words! He is an inspiration for me and many other people and the reason that makes him special because he is sincere ,honest and he do everything from his heart. God bless him and you all.